Over 100 of the very best performers from Sault Ste. Marie and the surrounding area will join forces onstage Sunday, October 5th at 2pm for a benefit variety show at the Soo Theatre in downtown Sault Ste. Marie. The Sault Ste. 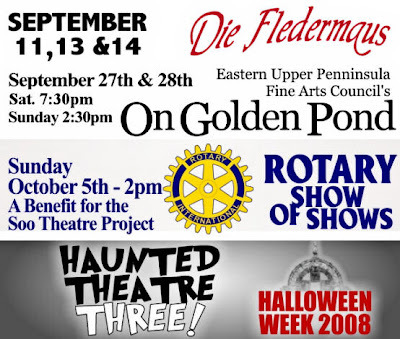 Marie Rotary Club and the Chippewa Sunrise Rotary Club are presenting the first ever Rotary Show of Shows with all proceeds going directly to the Soo Theatre Project to help continue its teaching, entertaining, and restoration. The fast-paced program includes a host of the area’s favorite singers, musical groups, and dancers. Rotarians will serve as theatre volunteers and hosts for the afternoon of fun. Music styles range from Broadway to country, jazz to hip hop, and rock to classical. Families are encouraged to be sure to bring the whole family. The audience will also be a part of the show as well. Show stoppers from Soo Theatre productions will be featured and a number of surprises are also planned. Performers scheduled to appear, in alphabetical order, include International Idol winner K.T. Antler; Susan Askwith; Denny Brooks, Bill Stanaway and Dave Stanaway; Melanie Case; The City Band; Maureen Delaney-Lehman; Lisa Dunn; The Footlight Dance Theatre (and friends); Dianna George; Judy Hendrickson; Karen Hughes; Liz Jacobus; Lola Kennedy; Sean Ley; The Lock Cities Chorus of Sweet Adelines International; The Methodist Bell Choir; Mark San Angelo; Jim Schmidt; Josh and Sam Scott; Singers United; George Snider; and Lise White. Tickets are just $10 for adults, $5 for children 12 and under, and are available at the Soo Theatre box office. Tickets are available at the door with special discounts available for groups of 15 or more. Call the Soo Theatre at (906) 632-1930 for more information, or visit the website at www.sootheatre.org. 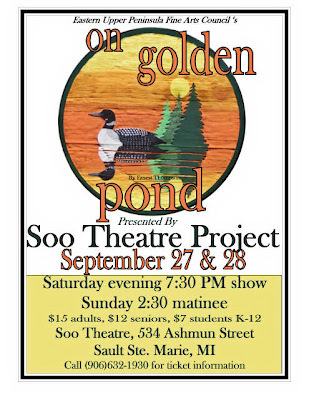 This summer's successful production of On Golden Pond will be on the Soo Theatre stage on Saturday, Sept. 27, at 7:30 p.m., and Sunday, Sept. 28, at 2:30 p.m.
Director David Rhinard of DeTour Village will also perform as Billy Ray in this memorable play. Ralph Shiplett, a newcomer to the stage, plays a wonderful Norman Thayer. He said he relates well to the role, being the same age (76) as Henry Fonda when he starred in the movie classic. Sandy Wytiaz, who has been in several productions, such as Steel Magnolias, brings a combination of feistiness and tenderness to Ethel that will tug at the audience's heartstrings. In this story of a lovable elderly couple spending the summer at their cottage on Golden Pond, Norman fears he is getting too old to enjoy life. The unexpected arrival of Billy, the son of Bill Ray, Ellen Thayer's romantic interest, breathes new life into him. The smart-mouthed city kid is played by another first-time actor, Tyler Davis, who takes to the stage like a duck to water. Heather VanDaele, a newcomer to DeTour and an experienced actor, wrestles with her belief that her father doesn't love her, pushing her mother, Ethel, to her limits. Dan Harris of Sault Ste. Marie, a veteran actor in E.U.P. productions, plays Charlie Martin, the mailman who has been pining for Ellen since they were kids. Somehow the dysfunctional relationships all get resolved, but you won't want to miss the fun along the way. This cast received standing ovations at the end of all of their performances in DeTour in June and in Curtis in July. Those who haven't seen On Golden Pond shouldn't miss this opportunity! Tickets are available at the door with special discounts available for groups of 15 or more. Call the Soo Theatre at (906) 632-1930 for more information. 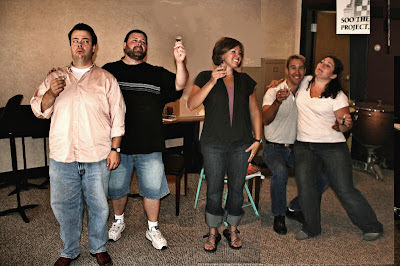 Die Fledermaus in rehearsal (L-R): Daniel Webb, Lance Hedlund, Rosemary Hollingsworth, Eric Shaw, and Karen Hughes. Karen Hughes, Pickford, lives a fairly ordinary life most of the year, but the STARS resident soprano and harpist does find opportunities to travel to distant places and share her wonderful voice internationally. This past winter one of her grad school opera directors let her know that auditions were being held for Mozart’s The Marriage of Figaro for performances in Italy. She traveled to Lincoln, Nebraska where one of the 10 U.S. auditions were held and, in April, learned that she had earned the role of the Countess. Karen had just completed the production of the Soo Theatre’s A Grand Night For Singing when she took off to a small mountain town outside of Rimini on Italy’s eastern coast, called Novafeltria. The 200-seat opera house called a teatro sociale with three round balconies and seating on the main floor is also used for community theatre, public meetings, and music concerts. Another performance was in Bellaria, a tourist town on the Adriatic Ocean. Hughes said the company arrived with their sets and costumes and walked through the sand and sunbathers to the stage. The sun worshippers made their way to a lovely outdoor dinner theatre performance literally on the oceanside. Hughes left for Novafeltria thinking she knew only the director. She actually renewed acquaintances with a former apprentice director she knew at Des Moines Metro Opera in 2003, a voice teacher with whom she had shared a masters class, another voice teacher from Minnesota, a Nebraska graduate she’d seen perform at her alma mater DePauw, and three of the singers in the chorus who are currently attending DePauw. It was exciting to find many persons that she had just met there all had close friends in common. Hughes admits opera is more popular in Italy than in the United States. “Most people know the stories and the history even if they do not attend the performances,” she remarked. Hughes struck up a conversation with her gondolier driver on a day trip to Venice. He talked about Mozart and drove her party past the home of Casanova who had been a good friend of Mozart’s number one librettist, the person who writes the story for the music. She said that, just as she is trying to expose young people from the Eastern Upper Peninsula to the opera art form, the Italians are just as excited about getting young people from their town into the opera house. Hughes said she chose Hansel and Gretel for the first opera at the Soo Theatre because it is a story that everyone knows. The Magic Flute was next--a fairy tale with princes and princesses and a magical story of courage and honor. This year’s production of Die Fledermaus will appeal to all ages, as it is a comic operetta by Strauss. It will be sung in English and is basically the German form of the American musical. Also known as The Revenge of the Bat, it is the story of Baron von Eisenstein playing a bad joke on a friend who plans to get back at him. The plot has a number of comical twists; and the cast is made up of many of Hughes's old friends and some new ones, along with local favorites like Anna Wilson, Rich Morrison, Mark San Angelo, Chris Friese, Trisha Wells, and a number of STARS students and other area performers. Eric Shaw, who grew up in Sault, Ontario, plays Herr Eisenstein and Hughes is his wife Rosalinda. Rosemary Hollingsworth, who was so wonderful in A Grand Night For Singing, is in the cast. Other guest singers have come from Knoxville and Omaha. This will be a chance to hear the lilting music of Strauss sung by marvelous voices and played by a talented orchestra. It is also a chance to laugh a lot as the story and song weave their magic. Tickets are available at the Soo Theatre, 534 Ashmun, 906-632-1930 for performances Thursday, September 11 and Saturday, September 13 at 7:30 p.m. and a Sunday matinée at 2:30 p.m. on September 14. Go online to the Soo Theatre website at sootheatre.org to learn more. Here's another article about Die Fledermaus with links to photos. STARS Fall Classes Start Sep 15; Sign Up Now! Registration is now open for fall classes at Soo Theatre Arts Resource Studios (STARS.) The 16 week fall term begins September 15 and runs through January 17. Interested students should register in person at the STARS office, weekdays 10 am to 6 pm. Brochures listing class times and tuition fees are available at STARS or on the web at www.sootheatre.org. Class offerings in dance include Movement & Dance, Pre-Ballet, Ballet I, Ballet/Jazz II, III, and IV-V, Pre-Pointe and Pointe, Ballet/Jazz A-B, Footlights Dance Company, Tap I and II-III, Jazz /Hip Hop and Ballroom I and II. All dance classes will be taught by Dianna George. Acting for teens will be taught by David Rhinard. Dianna George will be teaching Musical Theater and Acting for ages 8-12 and teens. Nancy Powers will be teaching Tunes for Toddlers for preschool children with parent. Karen Hughes will be offering Elementary Musical Theater and Voice Performance Class. Beginning Piano Classes for children, teens and adults will be offered by Ronda McGreevy. Handmade Book workshops for children will be taught by Linda Warrington. Lee Carlson will be offering yoga classes for adults. Private lessons will be available in violin, viola, cello, flute, clarinet, recorder, voice, harp, trumpet, trombone, French horn and piano. Nancy Powers will also offer Suzuki violin instruction for children ages 3 and older. Individual and group lessons with parent participation are a part of the Suzuki program. STARS musical groups meeting during the fall term will be Children’s Choir, Youth Chorus, Flute Choir, Flute Club, Recorder Consort, Young Readers Orchestra, Intermediate Youth Orchestra, Senior Youth Orchestra and “Not Quite Ready for Prime Time” Players for adult string players. For more information on any of these classes, lessons and workshops, contact the STARS office, 534 Ashmun St., Sault Ste. Marie, MI, 906-632-1930, or email: stars@lighthouse.net. Soo Theatre Project, Inc. announces its programming for fall 2008 at the Soo Theatre, 534 Ashmun Street, Sault Ste. Marie, Michigan. Tickets are available now at the Soo Theatre office and at the door. Discounts may be available for groups of 20 or more. Please call the Soo Theatre office at (906) 632-1930. Thursday, September 11 and Saturday, September 13 evening performances: 7:30 p.m. Tickets: $18 adults, $12 children 12 and under. Sunday, September 14 matinee: 2:00 p.m. Tickets: $15 adults, $10 children 12 and under. EUP Fine Arts Council's On Golden Pond (drama). Saturday, September 27 evening performance: 7:30 p.m.
Sunday, September 28 matinee: 2:30 p.m.
Tickets: $15 adults, $12 seniors, $7 students K-12. 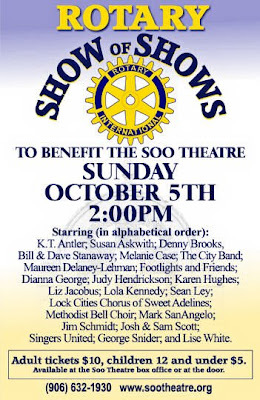 Sunday, October 5 matinee: 2:00 p.m.
Come join the fun as the Rotary Clubs of Sault, Michigan join forces to stage a benefit show for the Soo Theatre Project. The fast-paced afternoon will include many of your favorite local performers, many of the fabulous entertainers from STARS, and some surprises from the members of the Sault Ste. Marie Rotary Club and the Chippewa County Sunrise Rotary Club!